Today at 7 pm , to close the event, Raquel Pelta will speak with Aitor Menéndez about the relationship between graphic design and modern art. 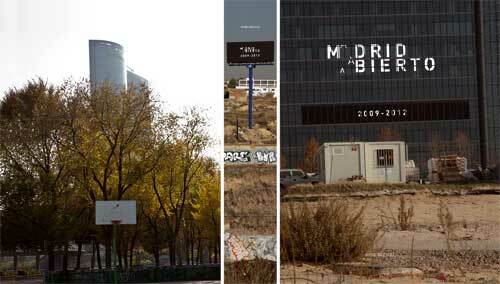 The latter will conduct a tour showing the image of Madrid Abierto in its different stages. 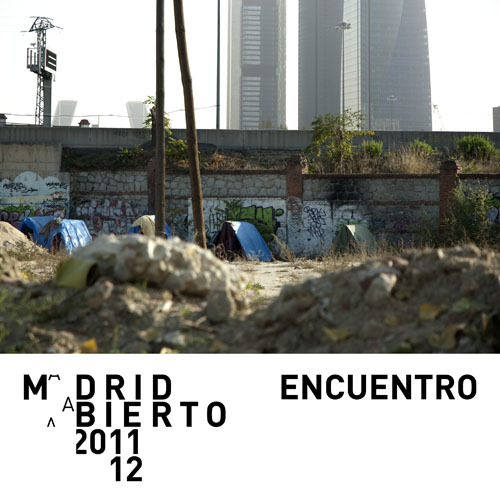 We will also present the Madrid Abierto 2009-2012 publication. FEBRUARY 9 th: FERNANDO LLANOS + CONVERSATIONS BETWEEN ISIDORO VALCÁRCEL MEDINA, SANTIAGO SIERRA AND JORGE DÍEZ. Next February 9th, at 7.00 pm, Mexican artist Fernando Llanos will present The death of Videoman. And at 8.00 pm, we will play the conversation of Isidoro Valcárcel and Santiago Sierra with Jorge Díez, director of Madrid Abierto. Tuesday to Friday: from 4 pm to 10 pm. ; Saturdays, Sundays and holidays: from 11 am to 10 pm. January 12th to February 19th. El Taller, Matadero Madrid. 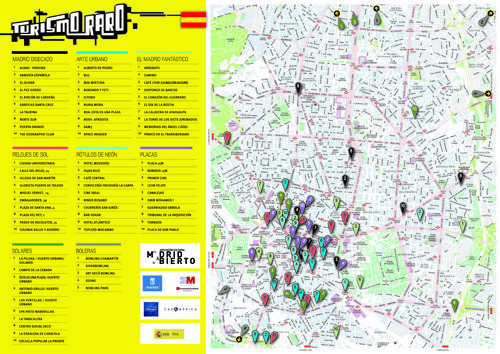 Within its ten years of existence, along six editions, the international program Madrid Abierto has produced 65 artistic interventions, which respond to diverse formats and tactics of actions -whether practical or symbolic- and which attempt to experiment new forms of critical dialogue with the political, social and cultural environment in where they have been developed. 1- Review of all the written material regarding all six editions and archive of Madrid Abierto, already available for the public to look up in Matadero Madrid, thanks to an agreement we have reached with this institution. 2- Preparation of a program of educational workshops that will take place with the collaboration of Universidad Complutense de Madrid, founded on the positive experience of the pilot project that was created during the last edition of Madrid Abierto. 3- Design and production of a documentary exhibition of the whole history of Madrid Abierto, for which an agreement already exists with the MEIAC of Badajoz and the Sociedad Estatal para la Acción Cultural (SEAC). 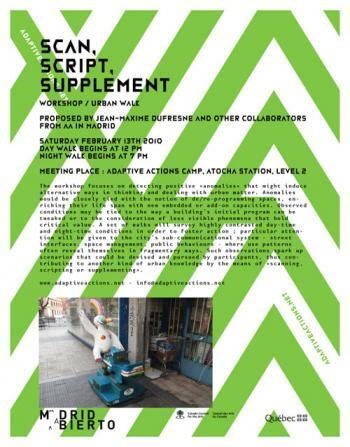 Adaptive Actions-Madrid. 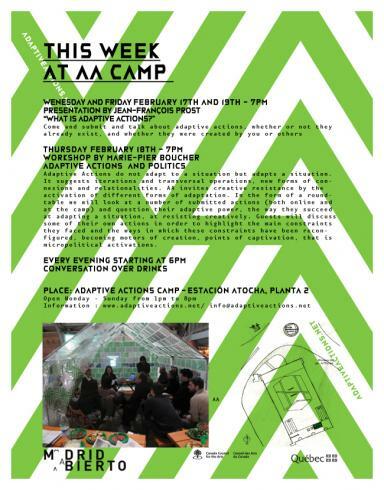 While the Adaptive Actions Camp was located in Madrid's Atocha train station for a month during the edition of MADRID ABIERTO 2009-2010, a publication was in the works. Several individuals simultaneously edited existing and incoming content (locally and via the web) and produced this recently published book, a 148-page publication comprising two sections: one presenting selected adaptive actions, and the second specific to the Madrid Adaptive Actions programming. The publication includes 36 adaptive actions with images and comments, workshops, and interview with philosopher and theorist Brian Massumi, and a text by José Luis Corazón Ardura. In Spanish and English. Edited by: Marie-Pier Boucher, Gema Melgar, Frank Nobert, Jean-François Prost. 1. To revise the entire set of documents related to the six previous editions, while organizing the Madrid Abierto archive, which in the following months will be available for public consultation in Matadero Madrid, thanks to an agreement reached with this institution. 2. 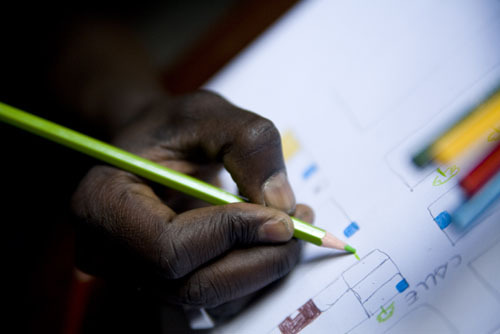 Preparation of a programme of pedagogical workshops, which will begin in January of 2011, based on the positive experience of the pilot project designed for Madrid Abierto's last edition. 3. 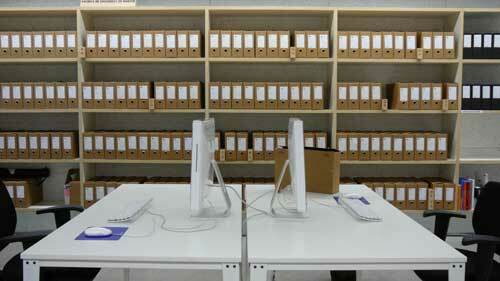 Design and production of a document based exhibition of Madrid Abierto's complete history. An interview by Jorge Díez with Susana Cremades, journalist and editor, she has also worked as labour advisor and social mediator. She is a neighbour of Lavapiés and has allowed Josep María Martin to gain access to the realities behind the neighbourhood's ‘pisos patera'. Location: La Casa Encendida´s terrace. Ronda de Valencia, 2. 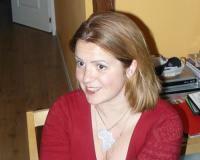 Schedule: 20.00 h. to 02.00 h.
Moderated by Cecilia Andersson and Jorge Díez. 4th of February from 6pm to 9 pm. 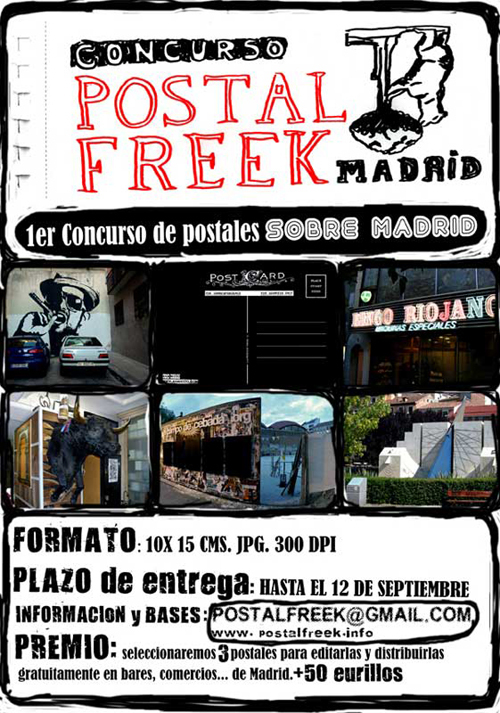 Participating artists: Lara Almarcegui, Laurence Bonvin, Teddy Cruz, Josep-Maria Martín and Pablo Valbuena. 5th of February from 6pm to 9 pm. 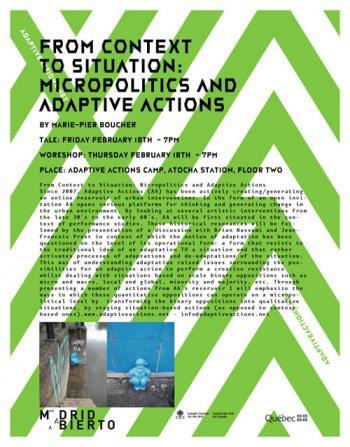 Participating artists: Susanne Bosch, Lisa Cheung, Iñaki Larrimbe, Adaptive Actions and Gustavo Romano.